Here we are again, Another week gone and nearly Christmas. And what a horrible week so far in the Uk, Rain Wind and more Rain. But I have had tubing in to make my top rig for my truck, so just have to make it up and heavily test it out before I let it loose on my clients. So I have put together a nice Little workout routine if you need to Do a quicky..
It’s just some of the best exercises you should do when in a gym..
It’s a really easy routine, nothing here very difficult. I will be writing up other lucky 7’s as times go by, Including Suspension Straps and Kettlebells etc. So look out for them very soon..
You can just ‘right click and Save’ on image, and either print it off, or upload it to your smartphone. I have a few slots left, So please contact me asap. 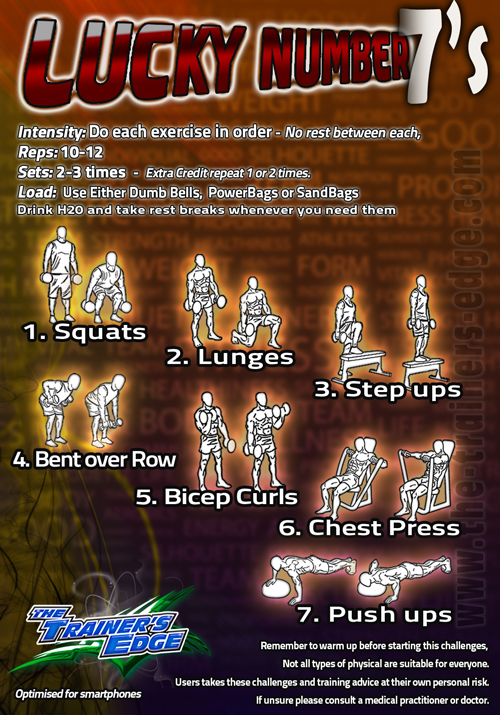 ← Kettle bell 101 workout.